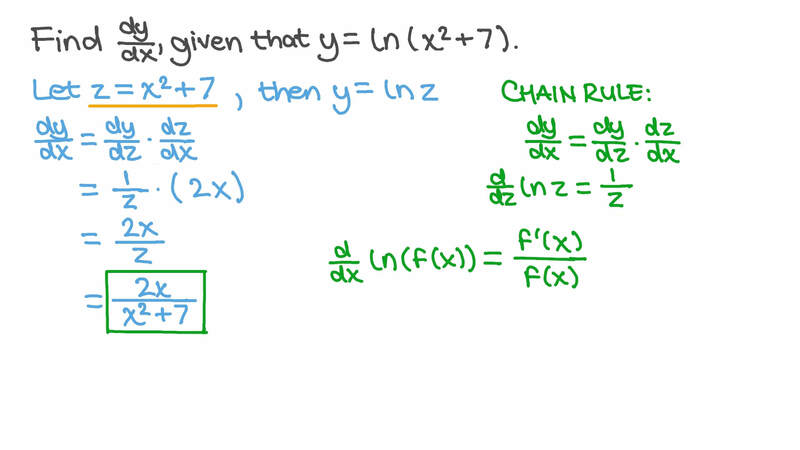 In this lesson, we will learn how to find the derivatives of logarithmic functions. Find d d 𝑦 𝑥 , given that 𝑦 = 6 6 𝑥 l o g 6 . Find d d 𝑦 𝑥 , given that 𝑦 = ( 𝑥 + 7 ) l n 2 . Determine the equation of the tangent to the curve 𝑦 = 𝑥 + 4 𝑥 3 l n at 𝑥 = 1 . Use logarithmic differentiation to determine the derivative of the function 𝑦 = − 3 𝑥 2 𝑥 .
Differentiate the function 𝐹 ( 𝑠 ) = 𝑠 l n l n .
Differentiate 𝑓 ( 𝑥 ) = − 3 2 𝑥 l n .
Find d d 𝑦 𝑥 , given that 𝑥 4 𝑦 = 1 2 5 l n .
Use logarithmic differentiation to find the derivative of 𝑦 , given that 𝑦 = √ 5 𝑥 𝑒 ( 𝑥 + 5 ) 𝑥 + 2 𝑥 2 2 3 . Use logarithmic differentiation to find the derivative of the function 𝑦 = 4 𝑒 𝑥 3 𝑥 + 5 𝑥 + 3 𝑥 2 2 c o s .
Determine the equation of the tangent to the curve 𝑦 = − 2  √ 2 𝑥 + 2  l n c o s at 𝑥 = 3 𝜋 4 . If 𝑦 = − 2 𝑥 + 1 6 4 𝑥 2 l n , find the value of 𝑥 at which the tangent to the curve is parallel to the 𝑥 -axis. Find d d 3 3 𝑦 𝑥 , given that 𝑦 = 5 8 4 𝑥 l n .
Use logarithmic differentiation to find the derivative of the function 𝑦 = 5 ( 𝑥 ) s i n 3 𝑥 l n .
Use logarithmic differentiation to find the derivative of the function 𝑦 = − 4 𝑥 5 𝑥 s i n .
Let 𝐴 and 𝐵 , respectively, be the 𝑦 - and 𝑥 -intercepts of the tangent line to 𝑦 = 2 5 𝑥 l n at 𝑥 = 2 . What is the length of the segment 𝐴 𝐵 ? If 𝑓 ( 𝑥 ) = 5 𝑥 + 9 3 𝑥 2 l n , determine 𝑓 ′ ( 6 ) . Find d d 𝑦 𝑥 , given that 𝑦 = − 8 𝑥 l o g 8 . Differentiate 𝑓 ( 𝑥 ) = 5 2 𝑥 l n .
Determine the equation of the tangent to the curve 𝑦 = 4 𝑥 − 7 𝑥 5 l n at 𝑥 = 1 . Use logarithmic differentiation to find the derivative of the function 𝑦 = 5 𝑒 𝑥 2 𝑥 + 2 𝑥 + 3 5 𝑥 2 2 c o s .
Determine the equation of the tangent to the curve 𝑦 = − 2  − √ 2 𝑥 + 2  l n c o s at 𝑥 = 𝜋 4 . Use logarithmic differentiation to find the derivative of the function 𝑦 = 2 𝑥 4 𝑥 s i n .
Use logarithmic differentiation to determine the derivative of the function 𝑦 = − 𝑥 𝑥 . 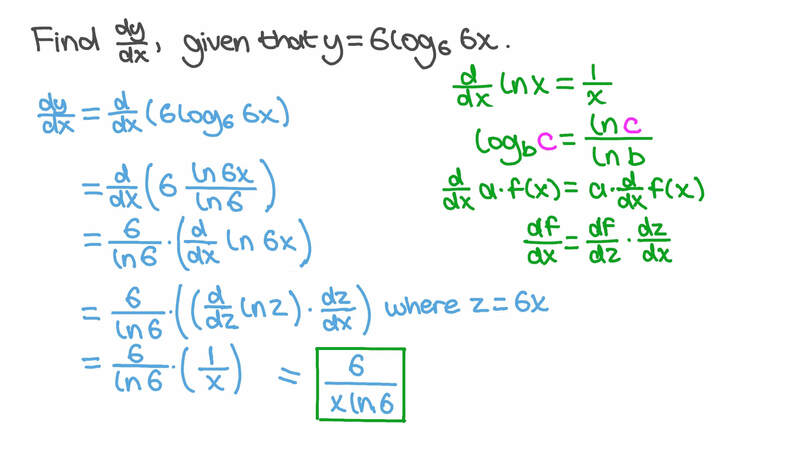 Use logarithmic differentiation to find the derivative of the function 𝑦 = − 2 ( 𝑥 ) s i n 5 𝑥 l n .
Find d d 3 3 𝑦 𝑥 , given that 𝑦 = 1 2 6 𝑥 l n .